AKWA IBOM – ExxonMobil affiliate, Mobil Producing Nigeria Unlimited, operator of the Nigerian National Petroleum Corporation/Mobil Producing Nigeria Joint Venture, has announced plans to invest N13 billion (US$43 million) in three community health, economic empowerment and education projects in Akwa Ibom State in the next 18 months. These investments amount to one of the largest community investments by any company in Nigeria. The three projects include a technical skills centre in Ikot Akata, a trauma centre at the University of Uyo Teaching Hospital and an engineering complex at the University of Uyo. 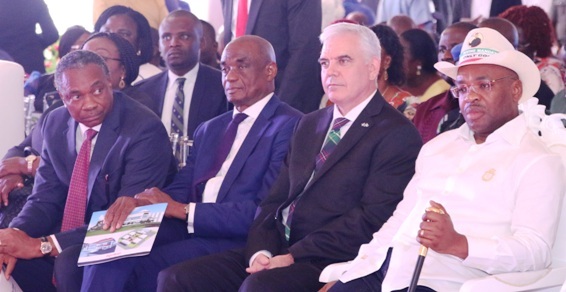 “These investments will provide long-term health, education and economic benefits to many in our communities,” said Paul McGrath, chairman and managing director of Mobil Producing Nigeria at the groundbreaking ceremony at Ikot Akata in Mkpat Enin Local Government Area, Akwa Ibom State. “We continue to work closely with the government of the Akwa Ibom State as part of our commitment to communities where we operate and helping to improve quality of life,” he added. Also speaking at the ceremony, Group General Manager of National Petroleum Investment Management Services, NAPIMS, represented by Hilary Akpan said the choice of the projects came after effective community engagement and consultation for viable impact. The Executive Governor of Akwa Ibom State, Udom Emmanuel who performed the official ground-breaking ceremony and inspected models of the proposed community assistance projects expressed his administrations readiness to provide all necessary support and an enabling environment for successful completion of the project. The technical skills centre will consist of a three-block training complex for critical skills required in oil and gas careers, such as pipeline fabrication, welding, electrical works, chemical lab works, civil works and engineering design. The center is expected to train more than one hundred students annually. The trauma centre, which is to be housed in a two-floor medical complex, will help reduce mortality rates in major medical emergencies. The centre will include a resuscitation and burns room; a theatre suite; helipad; ambulance bay and triage area; high dependency and radiology units; mini labs; wards; pharmacy; administrative offices; library; and doctor, call and seminar rooms. The engineering complex, which will be equipped with generators and independent water supply, will feature two floors of workshops, laboratories, a lecture theater, conference rooms and faculty offices. It is expected to serve about 2,000 students, mostly from Akwa Ibom State. ExxonMobil's CSR score includes Over N8 billion investment in educations (primary, secondary and tertiary) since 2008; N19 billion investment globally in the fight against malaria and N320 billion committed to Niger Delta Development Commission since 2001.